In 2016, I backed a high-tech coffee maker called the Spinn. At the time, I was enticed by the combined grind & brew capability of the Wi-Fi connected coffee maker, but the real reason I bought the Spinn was its patented centrifugal brewing technology. The tech, which I talked to the inventor about on a podcast back in 2016, uses a high-speed centrifuge to extract crema-like coffee brews down to the individual cup level. It all sounded pretty good to me, so I coughed up $300 and waited for my new coffee maker. However, now with the product’s original mid-2017 and revised first quarter 2018 ship dates in the history books, I’m left wondering: will I ever get my Spinn? I’m not the only one. 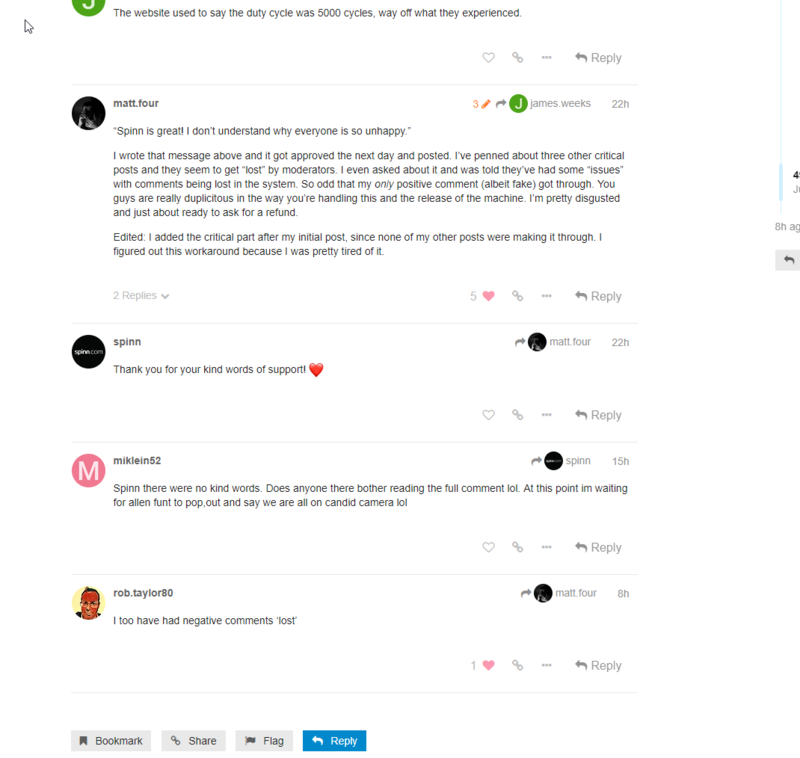 A casual perusal of the company’s forums or Facebook page shows that many of early backers of the Spinn are getting restless. Throw in the multiple emails I get per week asking me if I’d heard anything (from the volume of email I get about the Spinn, I gather I may be the only journalist monitoring the progress of the product) and it seems like the company has a bit of a trust problem on its hands. Now, it’s not like the company hasn’t been communicating. They’ve actually done a pretty good job of sending out periodic updates via its forum. The problem for the company is that once they missed their original ship date of mid-2017, they started telling all the first batch purchasers of the Spinn they’d see their coffee makers by the end of the first quarter in 2018. But by the time March rolled around, the company had moved the goal posts once again and said they were only sending machines out to “beta testers”. Now as with any crowdfunding campaign, I knew I was taking a risk when I bought the Spinn back in 2016. But I’d backed lots of hardware projects over the past few years, and Spinn seemed to check all the boxes. Not only did they have patented technology that was differentiated, but they’d also licensed their technology to Nespresso to use in the newest line of that company’s pod-based brewing machines. But almost two years later, I’m starting to worry I may have guessed wrong. Not only has the company missed two ship dates and is being vague about when the product will actually ship, but when I asked to talk to a “beta tester”, the company told me they cannot connect me to beta testers as they are “still going through iterations and bugs.” Add in other potential warning signs like the departure of the Spinn technology inventor last year and one can see why I and other early backers are starting to worry. To its credit, the company has offered myself and others a refund, but for now I’m going to continue to hang in there because I still really want a Spinn. However, like other early backers, I’ll be more skeptical about any deadlines the company gives since the company missed a long-promised ship date. At this point, I’m just hoping to see my Spinn sometime before Christmas so I can brew the coffee roasted with the Kelvin home coffee roaster, yet another high-tech coffee gadget I backed through crowdfunding. Previous articleCan #RecipeForDisaster Help Us Stop Wasting So Much Food? I needed this article. Considering that they’re only giving to beta testers, you still haven’t received yours, and they’ve removed the expected batch shipment dates at the top of their website, I’m not gonna wait another year. PS some of your links are only available to early Spinn backers not pre-order people like me. I’ve been waiting as well. I’m close to buying a Jura & backing out. I was hoping beta testers (if they exist) would start posting reviews. My sense is the beta testers are not backers. They are likely employees/family/friends. I haven’t seen anyone in the Spinn forum indicate they’ve gotten a unit. I ordered the Spinn to replace a Jura ENA 4 that, in the six years I owned it, went kaput three times, the first under warranty, the second out of warranty with a cost of about $250 to repair, and the third, which sent the machine into the garage because I didn’t want to drop another bunch of cash on fixing it again only to have it break. I decided Jura machines didn’t last long enough to be worth the cost. Spinn looked to be the perfect solution, and with an original ship date approximately six months after I ordered it, I figured I could make pour-over coffee until then. This summer, Spinn will be missing its first promised ship date by a year. I still want the machine, but I’m not sure I will be willing to wait much longer. I have been waiting since January 7th 2018 on 3 different units. Have you received yours Thomas? They are also still spending thousands on digital ads on FB and Instagram. So to add to the “ugh oh” train, they are likely out of money for actually producing the product and why things are so delayed. Went through similar b.s. with the Arist machine from Kickstarter. Difference is, kickstarter does not give a crap what happens once a project is funded. There is no way to get refunded. They began late 2014 with the promise of a machine by mid 2015. Their updates were always very vague and they rarely showed anything that represented progress. The thought was – they were super secretive to prevent their tech from being stolen.. Another thought was the whole thing was a scam the entire time. The other thought was that they were just a bunch of people punching above their weight — incompetent. I have been attempting to follow the progress of Spinn just because I hope it isnt Arist 2.0. There is very little a non-backer can see about their progress. Again — is this a scam or just incompetence? Not sure doesn’t seem likely the machine will ship any time soon. OMG! What a scam! There has to be legal action you guys can collectively take. I believe Spinn has promoted this too much to be a scam especially since they’ve sold the machine’s design to Nespresso which they are currently using. Being WiFi connected is tough and they probably really are working out the kinks. Spinn refunded my money last week, I don’t think the same can be said about Arist. But thanks for the heads up, I had no idea Kickstarter could be a platform for scams to string people along. mid-2017 has come and gone. Q1 of 2018 has come and gone. The delivery dates were moved from FAQ to “Pre-order” section of your account settings. When you go there, you get “You’re in the 1st batch! Order shipping date has not yet been announced.”. So we’re actually going backwards in terms of a communicated delivery date. That combined with the constant Spinn marketplace emails to buy whole bean coffee that I can’t do anything with besides chew, provides a waining amount of trust. @David – Agreed: I think it’s the regression that has me most concerned. On the other hand, the team continues to send monthly updates complete with pictures and also is still issuing refunds. The biggest red flag for me on following progress of a hardware startup is silence, and Spinn continues to communicate, even if it’s often frustrating. While I don’t know when they’ll ship, I am still hanging in there with the belief they are sincerely trying. They are HEAVILY moderating their community forums. A lot of users put on premoderation. All new users are on premoderation. And any message that is not suitable for them just not published. For example i tried to ask whats up with 220v version of machine in the corresponding topic, and i tried to do that like 4 times. And none of my messages got published. Just a simple questions. And there tons of users like me. I’d like to know if anyone has actually received one of these. I ordered one in the 4th batch. Have batches 1-3 even been shipped? My understanding is only beta testers – which I think are probably friends/employees of Spinn – have had a Spinn. I don’t think they’ve entered into production, but only have made a few beta test units. So…no. Rick Ordered batch 3 back in January 7 0f 2018, I still haven’t not received the 3 that I ordered. I am interested to find out when they actually begin shipping product… will someone please update when they get their machine? I see now on their website they are promising “5th batch” products shipping at the end of 2018. “Is it possible to provide a more precise delivery timeline? I was one of the first batch pre-orders, but I gave up my spot six months ago. I thought the bait-and-switch they subsequently pulled with the end-of-first-quarter ship date was pretty outrageous. I’ve remained curious about their progress, such as it is. Each monthly update (usually posted much later than promised) notes new issues that should have been identified earlier. They have never adequately explained why the warranty is being kept to a mere six months, other than “as a startup we need to be careful of our cash expenditures,” which shows a lack of confidence in the product. Throughout this process, they have had a tin ear when it comes to less-than-positive feedback. I would not be surprised if they eventually decide to focus exclusively on their coffee bean ordering business. In fact, on their Wikipedia page, which I assume they’ve edited, Spinn is described as a “San Francisco-based coffee-subscription business.” The coffee machines are clearly secondary at this point. 1. Their site currently says “4th Batch Sold Out” “5th Batch Ships End of 2018”. Considering batch 1 hasn’t shipped and neither have we gotten any promising update that it will ship soon, it’s highly unlikely that 5th batch ships this year. I don’t have to work there to know that, why are they advertising that? It seems like they keep misinforming buyers for their own benefit. 2. On their site they mention “The first machines are estimated to start shipping at the end of the first quarter of 2018. We are then ramping up production for the following batches throughout the year.”, which we all found out all the sudden that the first shipment was for “beta testers”. No one has heard from a beta tester, seen pictures, or anything. Do they really exist? Why did it take until then for them to reveal that first shipment was for beta testers? 3. They have gone MIA on their social media. Haven’t posted on Facebook since 2017 and twitter since April 2018. Although, Instagram which they run the most ads on from what I’ve see they seem to update most frequently. 4. The “monthly” updates on their site are usually just enough to keep backers intrigued but really provide no information on the actual status of the machine. If anything, they give a reason to expect waiting another 3-6 months at the very least. 5. There isn’t much bad press about this whole situation. You might think this is a good think but Spinn is hoping most people that order will forget they ever ordered overtime. Anyone who complaints they provide a refund to without questions to prevent them from complaining around the web and press picking it up. I too sent them money a while ago. Never hear anything from them. This is smelling like a scam vs morning coffee. They have also made it a think to block forum users if you ask to many questions. I ended up with all my posts needing to be approved by an admin for a few months. They opened it up for me one day and I started a thread asking if more users had been blocked. They deleted that thread and permanently banned me from posting saying I was not welcome on the forum anymore. I have cancelled my preorder and I think people should do the same. This whole thing feels like a scam. Me too. Plus a few who suffered the same treatment and complained on Spinn’s f/b page. I just found this article and thank you to Michael. I plopped down my monthly social security check in Oct 2016 for many of the reasons you mention in your article. I was an active commenter in their online forum until I suddenly got “read only” status, presumably because I wrote a spoof newsletter referencing their inability to communicate meaningful data, and I included a mock “timeline” where they were going to let us know about the progress being made to create a shipping timeline. They bounced me and removed all my prior posts, which included my many references to their misnamed “monthly updates, which were actually deci-annual (every one tenth of a year -every 36.5 days). One other thing I questioned was the status of certification by various agencies for safety – UL for 110vac and grounding, FDA for components that contact food that are actually food grade, the FCC for radio frequency emissions. And that’s just for the US. Every time they find a problem and need to retool, the machine needs to be recertified. The Spinn team has no idea of the length of time it takes from sibmission to certification. I cancelled immediately after being booted as I figured that any company that is so tight-*ssed about such a minor jab is never going to ship a decent product. It looks like they are in the refund business. Taking preorders, funding their operations and salaries and asking us to wait. I have tried twice and it will be my second refund. Everyone who ordered might consider getting the money back before the company spinns into bankruptcy…. I’ve supported a few crowdfunding ventures in the past. And Spinn would be one of them had I heard of it sooner. So much potential. I can imagine the technology will be the norm in the future. But for now it seems the only way I’ll wake up to fresh espresso is if I sweet talk my boyfriend into making me some. Diane – glad this was of help. I think it’s important for folks to know where things are. One of the disappointing things with Spinn is they continue to advertise heavily on social media despite their inability to ship (yet). My feeling is they are really trying and will eventually ship, but I also have to wonder if they are in a cash crunch since they continue to sell preorders and are fueling demand with advertising. Yeah, that was a red flag for me too. With over 12 staff on payroll and the shiny marketing campaign, their expenses must be thru the roof! But I’m a glass-is-half-full person and I believe you’ll get your machine. And then I’ll be kicking myself for missing out on the pre-order deal. I ordered my Spinn machine in December, 2016. Today I requested a refund. Up until now I have been content to wait it out, but the series of videos Spinn sent out in their August update convinced me that the machine will never work as promised. In particular, the pathetic dribble of coffee from the machine in the videos of the exceptionally slow brewing process suggest that the machine will never be able to brew coffee well. It was much louder than I anticipated as well. Michael, thank you for your article. I too was an early adopter and as of today I have requested to be refunded. This might sound crazy but I have a theory. I don’t think they have ever intended to release a physical product. I believe that their priority was to create a bean subscription service. It’s actually pretty genius if this is the case. Think about it.. they show off an amazing product at an amazing price and crowdfund for it (all the rage in 2015). They sit on the money for a bit and then release a subscription service (also all the rage in 2015). That subscription service is now a risk free interest free business startup. The only capital they need to put up, their time. Now the business has 2 options, succeed or fail. If they are successful in their new venture they repay the interest free loan to their “investors” with the profits from their subscription service. Should the subscription service fail they file for bankruptcy and walk away. There aren’t many startups that have this luxury. Is it a conspiracy, yes. Is it plausible, definitely. I pre-ordered the plus machine January 1, 2017. So, it’s approaching two years waiting on this thing. It’s very bothering that there was no September update. But, I’m getting constant emails about their marketplace. I will not spend a single penny in the marketplace without a machine. If there is not an encouraging update by November, I will have to consider asking for a refund. I ordered back in 2016 and canceled and got a refund check after they banned me from their Twitter page. I’m glad I was right I hope you get a refund before they go out of business. If they ever start shipping and the device is good buy it then. 5TH BATCH SHIPS END OF 2018” I lost all faith that they are operating in good faith. Cancelled my order 6 months ago, especially when I heard they sold some of the tech to Nespresso, wonder how much they got for that. Their website now says shipping middle of 2019, that will be almost 3 years for early adopters! Do you have any updates on the Spinn??? Anyone actually using one yet? They are still not giving firm updates on delivery date. I had asked multiple times and have not been given firm guidance. I will have updated post soon. I ordered May 16th, 2016. I’m in the first batch. We’re coming up on three years of waiting. You might think I have the advantage of getting in early and getting a low price, right? nope. I actually spent the exact same in 2016 that I would spend today. What a bummer of an experience. I’m getting a refund and I suggest you all do too. Ha! I put money down for this machine in Nov. 2016 (I’m a 1st batch-er) and at around the same time my husband put down money for a Tesla Model 3. At least I now have a smooth ride to the coffee shop! This machine is still coming up on “best gifts for the holidays” lists. Can’t believe it! I’m bailing. I emailed them again a few days ago and was told there was going to be an update today (dec 21) but still haven’t seen anything. I totally understand mfg prototypes and execution is tough, I’ve been a co-founder, venture investor and now an operations exec but the biggest crime is not being transparent and communicating with your supporters. Based on some on-line videos there seems to be some beta units out there but they never show the coffee or review the taste. Just seems very lound and no visual of the app or WiFi capabilities. Does anyone have any updates on this machine? You can check their community site. They post updates there. But in shorts all of they updates is like this – we fixed x,y,z problems, but found new q,w,e problems that we will work on. Its nowhere near production and there like 0.01% chance they will deliver anything in 2019. And they still censoring their forums like a hell, not allowing any negative comment at all, even neutral ones, only positive is going through moderation.